Killer Whales, also known as Orcas are toothed whales that belong to the family of oceanic dolphins. Feeding, habitat, distribution, reproduction, evolution, communication and all the information about killer whales. Killer whales are starting to suffer the effects of global warming and habitat loss. You will learn plenty about human culture and what the Killer Whale has meant to them over time. Throughout history, orcas have been inadequately considered and the lack of knowledge about them, as well as the myths that have circulated for generations, have caused them to be cataloged as sea monsters, enemies of all aquatic species and mainly, “killer” whales. This belief comes from long ago. 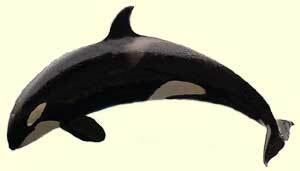 Their scientific name is Orcinus orca, from it, the word Orcinus means “from the realm of the dead,” relating to the Roman god Orcus master of the underworld. Later, poor translations ended in a name that eventually brought more fear to people, killer whales; both titles are incorrect. That is why now conservation groups are trying to eradicate that name to be replaced simply by orcas. Killer whales are marine mammals belonging to the family Delphinidae, formed by several species of dolphins, false killer whales and pilot whales. They are only related to whales up in the higher Cetacean order; however, most whales belong to the suborder Mysticeti (baleen whales) while orcas belong to the suborder Odontoceti (toothed whales). Orcas are very large and strong animals that can reach up to ten meters (32.8 feet) long in extreme cases and have an excellent sense of hearing. Morphological characteristics, social behavior and developed survival instinct make them apex predators and the mammal species more globally distributed after humans. Killer Whales are marine mammals. Killer Whales can swim up to 30 mph. According to researchers, such amazing features were not always so. Based on scientific evidence, orcas descend from a terrestrial ungulate species, closely related to hippopotamuses, but evolution over millions of years has result in these delightful animals that we know today. Not all orca pods are the same, and many distinctive characteristics exist between them, so it is still under research if they are individual species created by a continuous evolutionary process, or their differences are only the consequence of their specific habitats and conditions. One of these variants is their feeding habit. Orcas not only feed on the meat of marine mammals. Those inhabiting the waters of the eastern North Pacific known as residents prefer to feed primarily on salmon, transients who share the same region, usually make coordinated hunts for sea lions, minke whales and seals, among other species. For the latter, they employ incredible strategies that attract the attention of scientists because they can even get to the shore to chase their victims and return to the sea easily without getting stuck, an activity difficult to understand with such size and weight. Besides those amazing skills, orcas are a highly social species, organized in matriarchal structures, which have developed complex communication systems. Researchers think that orcas are able to perform conversations and mothers “educate” their young and teach them discipline, as well as techniques for hunting. Communication between pods is also another difference between the different groups that inhabit the oceans; there are not two pods with the same dialect or repertoire of sounds. We immediately relate dolphins with intelligence and orcas should be included in this classification. There is evidence to suggest that they are highly intelligent creatures, whose brain components are parallel to those from great apes, elephants and even humans. Even more, humans and cetaceans are at the top of the encephalization quotient (EQ); orcas are third is such list, only after, humans and bottlenose dolphins. 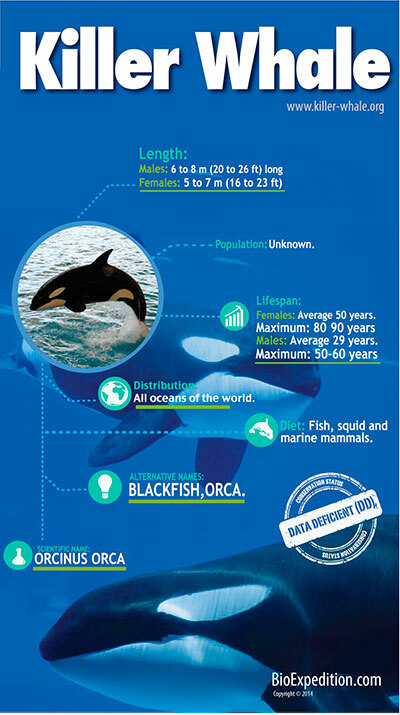 Orca intelligence featured in several scientific papers can be observed by ourselves in videos and documentaries. Have you seen how they work in teams? You will be surprised. Regrettable orcas are not free from the threat caused by nature and human irresponsibility. Fungi, parasites and bacteria can stay inside orcas and reduce their quality of life; Hodgkin’s disease, which causes stomach ulcers, tumors and skin disorders, has been the cause of the death of some individuals. Orcas can acquire these infections within their environment for various reasons, which turn out to be inevitable. On the other hand, threats from human activities include commercial whaling, waste and noise pollution, declining prey by commercial fishing, global warming and their capture for displaying at water parks around the world. They are not classified as endangered, but their precise population is unknown, therefore in some areas with intense human activities, some sub-populations have been declared threatened. All animals are important to the ecological balance, and orcas being apex predators, play an important role in the balance of the ecosystem. Learn the details about every aspect in the life cycle of a killer whale and share this learning with the people around you. It is essential to take care of them properly.